Students with Learning Disabilities 7 Edition The seventh edition of this popular text for learning disabilities offers comprehensive coverage and a balanced approach of all of the varying theories and practices in the field—educational, medical, and psychological—incorporating assessment, definition, characteristics, and strategies–all to help readers develop their own personal perspective. It presents equal treatment to information about the characteristics, definitions, causes, and controversies of learning disabilities, with each researched-based topic clearly designed to support both diagnosis and intervention. Throughout the text, “best practices” have been identified through thorough research and practical examples. Revised to include the latest research and recent developments, the seventh edition reflects the latest trends in the field of learning disabilities. 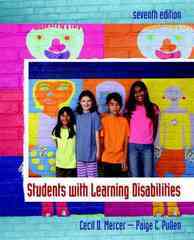 Current and classic, Students with Learning Disabilities, Seventh Edition will stimulate and interest its readers about the nature and needs of individuals with learning disabilities in today’s school environment.